← Choose Your Own New Year’s Eve 2014 Adventure! 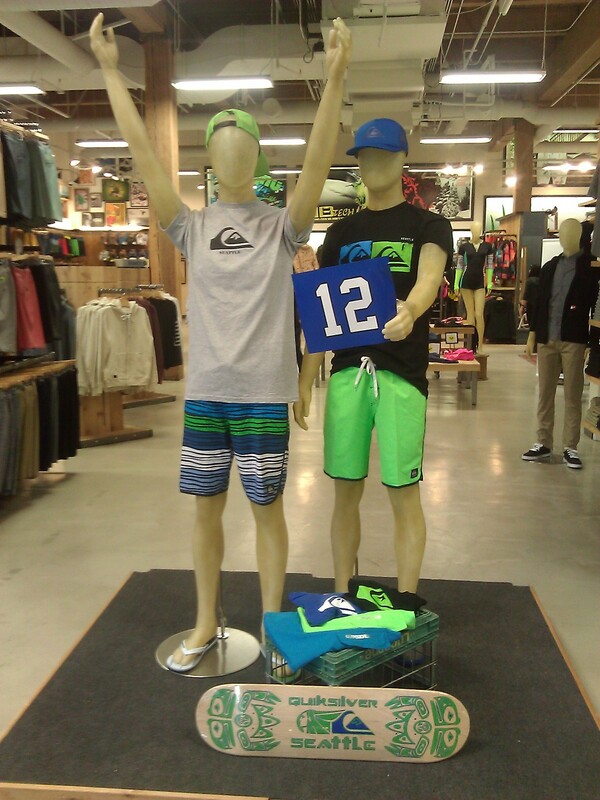 Superbowl XLVIII is a little more than a week away, Seattle has officially succumbed to Seahawks fever. It has been quietly simmering away just under the surface of society since the beginning of the season 5 months ago. But after winning over 80% of their regular season games, enthusiasm for the Seattle Seahawks has finally boiled over. The Seahawks as a part of the Superbowl is a relatively new idea that people have to get used to (they lost to the Pittsburgh Steelers in 2005), but it’s not like fans haven’t had faith all along – CenturyLink Field has consecutively sold out for the past decade, and the waiting list for tickets has 10,000 names on it. 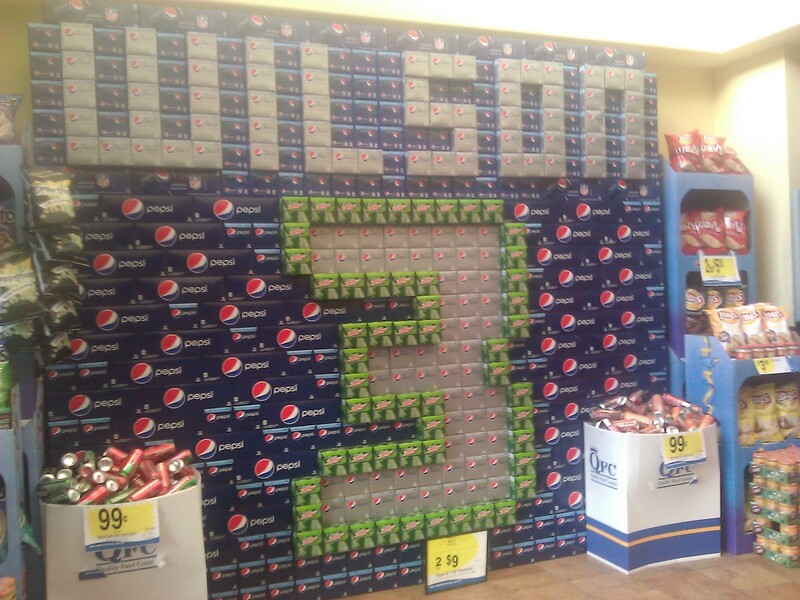 So who has the display of ultimate Seahawks fandom? Who is the #1 12th man? Here is a handy guide to seriously kick-starting your Seahawks Superbowl spirit, as well as examples of some of the local businesses and organizations with the most eye-catching team spirit. 12th Man Flag – There are 11 Seahawks on the field each game, and the twelfth is the fan support. This season, Seattleites set- and then reset- the world record for loudest stadium noise with 137.6 decibels. Opposing teams specifically compensate for this distraction in practice. 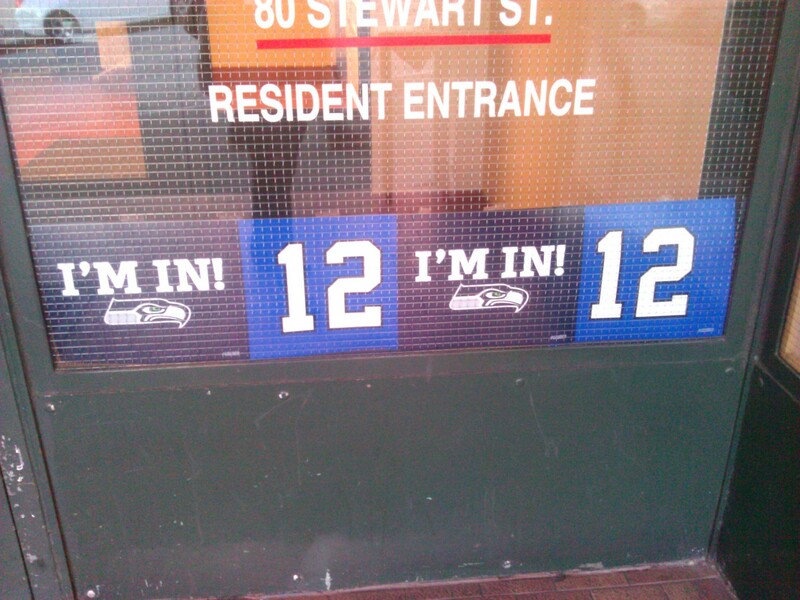 GOOD: Dozens of Seattle businesses are sporting their 12th Man ‘I’m In!’ posters in their windows. It’s simple and effective. 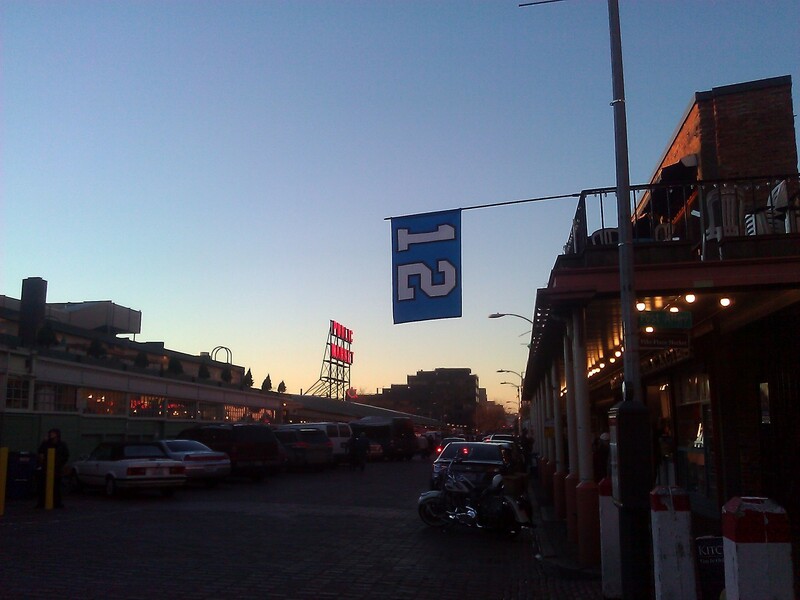 BETTER: Large flags like this one in the Pike Place Market hang from businesses and households alike all over the city. BEST: The Kell’s location downtown certainly has the right idea – all or nothing. Window Displays – Many local businesses have blue and green clothing up front, but their enthusiasm is not explicitly emblazoned across their storefronts. But some local businesses have gone above and beyond announcing their NFL affiliation. 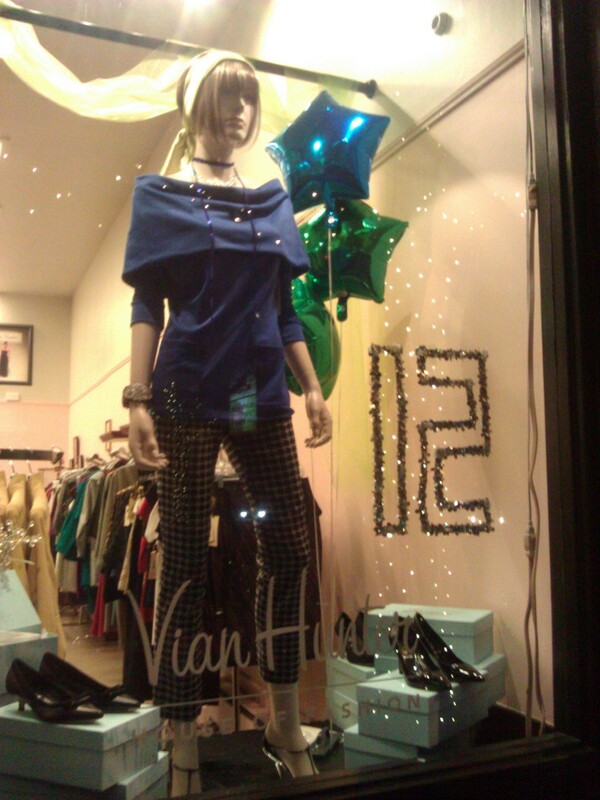 GOOD: Ladies consignment store Vian Hunter in Madison Valley expertly mixes the team’s blue and green colors, the number 12, and vintage fashion. 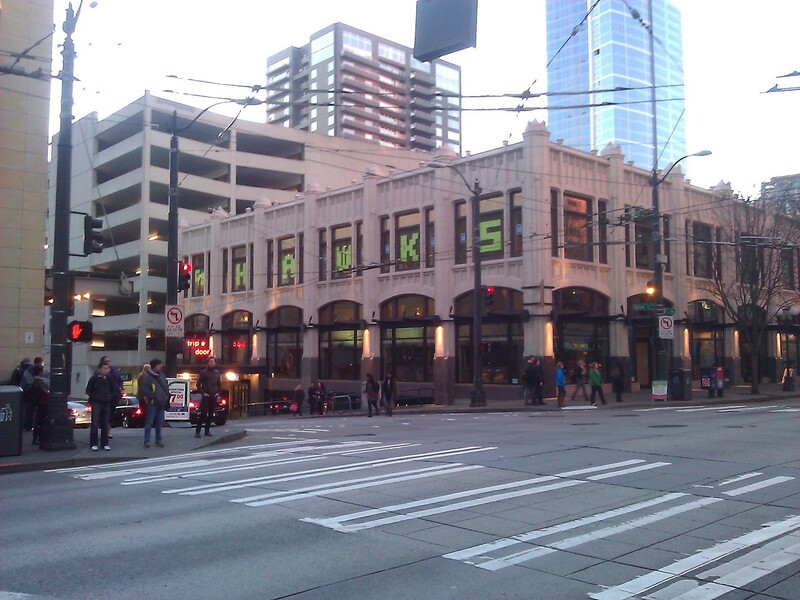 BETTER: The Quicksilver store on 1st Avenue brings out all their lime green gear to match the Hawks. BEST: This sort of enthusiasm wouldn’t be out of place at a sports bar or an outdoor gear company, but is completely unexpected (and awesome!) for a couture pioneer like Baby & Company. 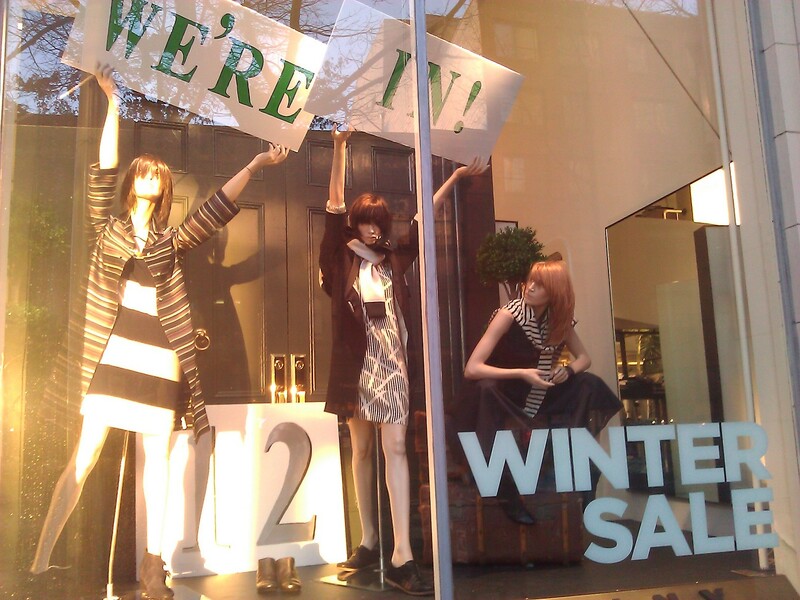 Paper Window Signs – If you’re a true fan, you want to proclaim it to everyone who passes by! 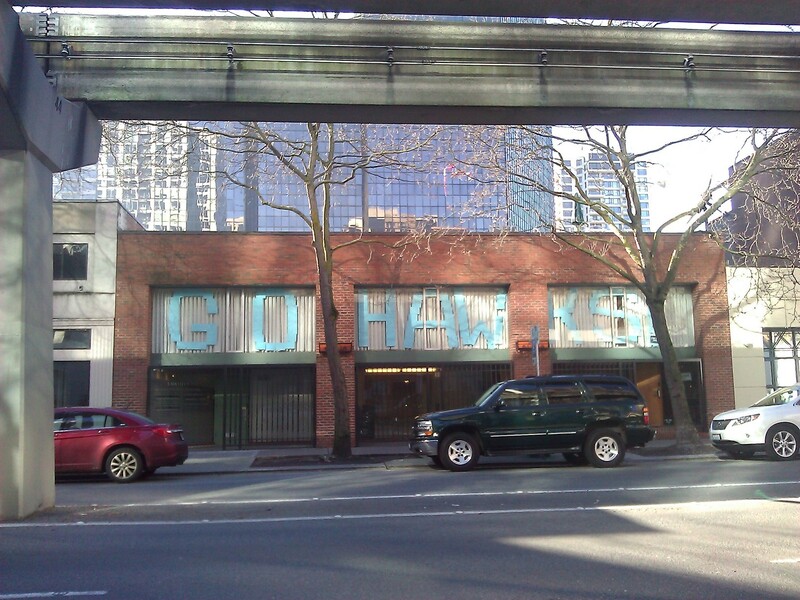 These Seattle storefronts took advantage of the materials they had on hand, and made creative spirit statements with paper to show off their football pride to the outside world. GOOD: Below the Monorail on 5th Avenue, this Seahawks fan will be running low on blue printer paper in the next week or two. 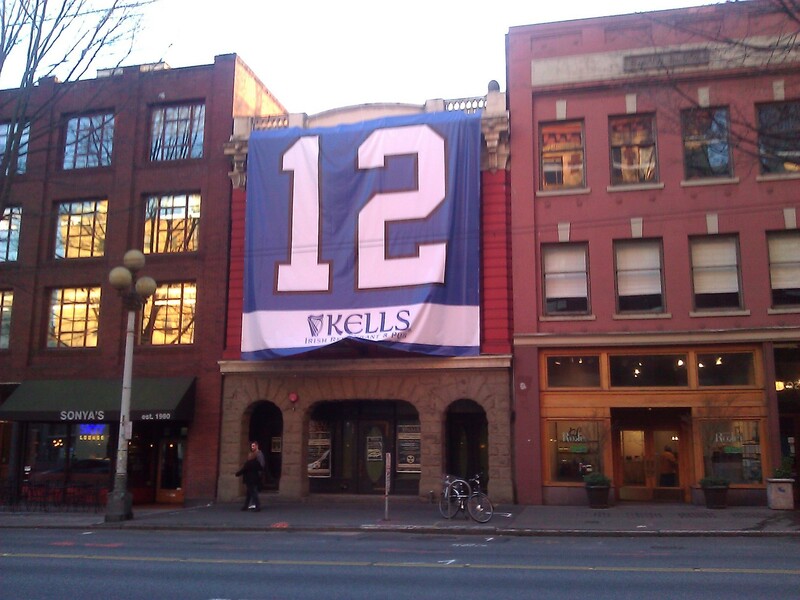 BETTER: Above Wild Ginger at the corner of 3rd and Union, these Seahawks enthusiasts went for a similar, but more visible approach to announcing their affiliations. 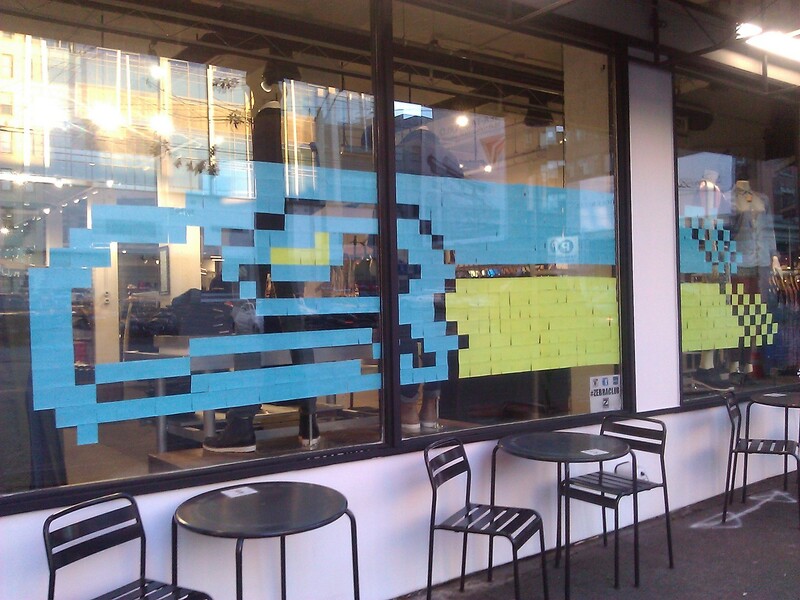 BEST: Some poor Zebra Club intern probably spent hours mapping out a PostIt matrix to ensure that their window decoration was perfectly aligned. And boy, was it worth it! 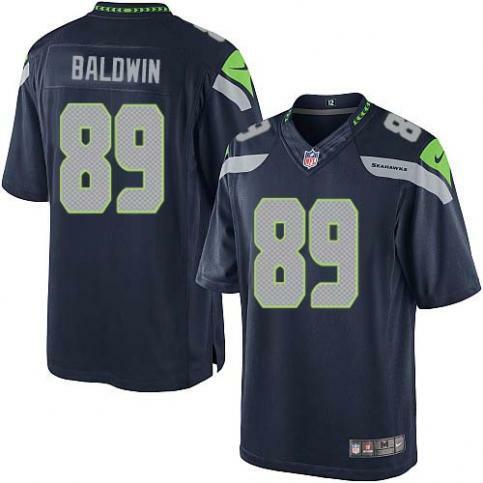 Supporting Your Favorite Player – For the most dedicated 12th man, sporting a generic Seahawks scarf or hat isn’t enough; they have to show support for their all-time favorite player. GOOD: A professional jersey from the NFL store is a timeless classic. 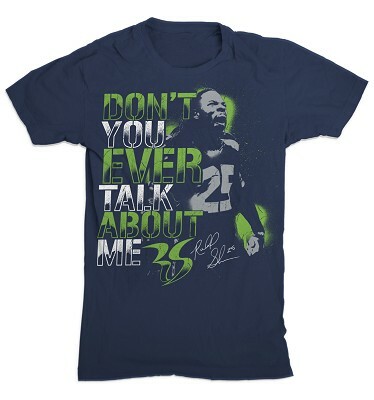 BETTER: Instead of giving a shout-out to an individual Seahawk, why not draw attention to your favorite moment or quote that player had? Richard Sherman’s post-game interview after winning the NFC West championship seemed to make quite an impression. BEST: Gee, I wonder who the official soda sponsor of the NFL is – any ideas? Party Food – No one should watch the Superbowl alone. Much of the appeal of pro sports games is the camaraderie and feelings of collective victory (hopefully) or defeat that make every viewer feel like they are there at CenturyLink, surrounded by tens of thousands of like-minded Hawks fans. Next Sunday, people will be gathering all over the city to cheer their team and eat delicious food. So what will people be serving? GOOD: Cupcake Royale always has topical and fun decorations for their confections, like little sugar mustaches for Movember – observing “No-shave November” to support men’s health. 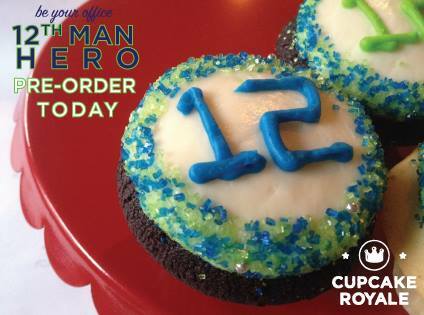 Plus if you show up at your party with some 12th Man cupcakes, you are guaranteed to be everyone’s MVP. 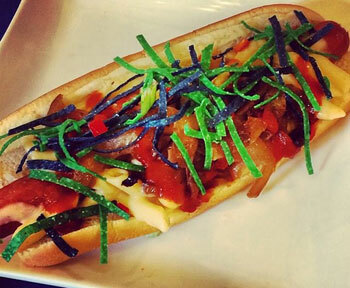 BETTER: This season, CenturyLink has rolled out new culinary creations to serve at games. If you’re hosting guests, fire up the grill and prepare some “DangerRuss Dogs” inspired by Russell Wilson- a foot long hot dog with mac’n’cheese, caramelized onions, honey Sriracha hot sauce, chopped jalapenos, and served with blue and green tortilla chips. BEST: If you’re prepared to go all out, take a page from the Food Network’s cookbook. 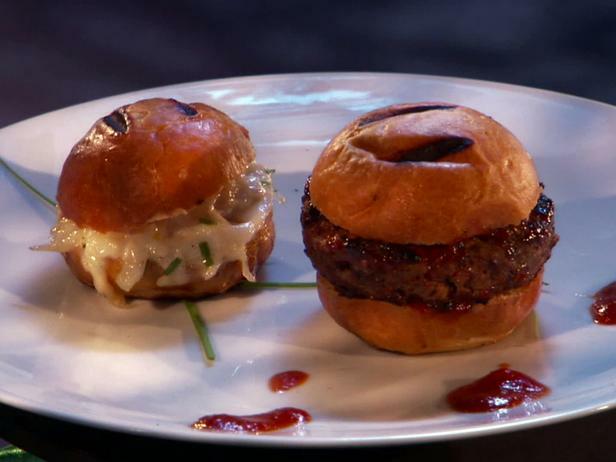 During the “Seahawks vs. Packers” episode of their show Tailgate Warriors, the Seattle team whipped up dishes like these “Gonna Score” Sliders and an Emerald City Salad. For more ideas and recipes, click here. This entry was posted in Photo Gallery, The Seattle Scene and tagged 12th Man, Baby & Company, CenturyLink Field, Cupcake Royale, Doug Baldwin, Food Network, Kell's Irish Pub, Quicksilver, Richard Sherman, Russell Wilson, Seattle Seahawks, Superbowl XLVIII, Tailgate Warriors, Vian Hunter, Zebra Club. Bookmark the permalink.